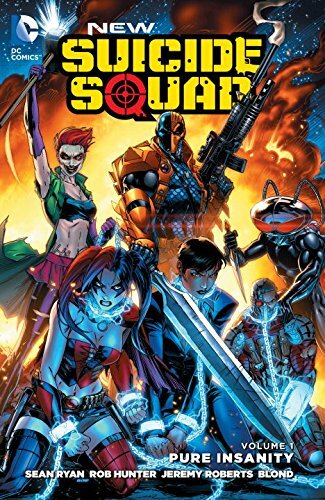 * I received a copy of The New Suicide Squad, vol 1, Pure Insanity for free in exchange for an honest review via Netgalley. Honesty moment, while I love DC Comics, and am a big fan of their imprints like Vertigo, I’m not always up to date on all of the newest superhero plot lines. They often times just don’t do it for me and the thought of delving into the superhero universes that are already long-established, like Marvel or DC, is overwhelming to say the least. I wanted to read The New Suicide Squad, vol 1, Pure Insanity for a couple of reasons. (1) It seemed like a reasonable jumping-on point for the storyline; (2) The concept of the Suicide Squad is intriguing; and (3) There’s a new movie coming out for the Suicide Squad and I wanted to know a bit more about the story before jumping into the theater (a typical thing for me). The Suicide Squad is one of the more inadvisable ideas to ever plague Gotham’s leadership. After arresting or otherwise detaining a number of Gotham’s big bad villains, chips are implanted into the villains’ necks which will explode if the villains do not comply with commands given them. Under the supervision of Agent Waller and the U.S. government, the villains are forced to team up and take on existential threats to the U.S. The chaos and misadventures of the Suicide Squad is pretty expected. In the New Suicide Squad, vol. 1, there are a number of notable villains, including Deadshot, Manta, Harley Quinn, and The Joker’s Daughter. The trade paperback includes two plot arcs, one involving Russia, the other China. I had a mixed reaction to the bind up. The story is fun. It’s action-packed with some fast-paced battles and interesting conflicts. The entire concept is interesting. The art is a dramatic stylized style with odd angles and proportions. The pallet is dark, understandably so. Everything seems swathed in shadow. Granted, there were a lot of panels where a punch seems to land on someone’s crotch, even though it seems more likely that the target was the stomach. I don’t know, maybe crotch punching is all the rage. I was, however, left a bit underwhelmed by the character dynamics, which seemed forced, and by the lack of cohesion in the plots. While Manta serves as a kind of binding agent, consistent throughout the story, the other characters are overly-volatile, inconsistent, and oddly positioned. There isn’t a lot of backstory built into the book. This is not the volume to pick up if you want to know how and why the Suicide Squad exists. It was a fine comic, just not quite smooth enough storytelling for my tastes.